It looked like a rock to Matthew Berger. But when the 9-yr.-old turned it over, he saw the fossilized collarbone it held — his father was going to be very happy. More like ecstatic. The find, that soon included most of the skull and several other bones belonging to the nearly two million-yr-old remains, was the greatest find in paleoanthropologist Lee Berger’s life and could be a new link between man and his apelike ancestors. 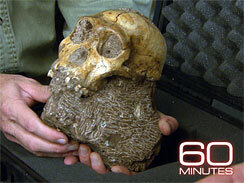 Bob Simon was given rare access to the discovery of Australopithecus Sediba in a segment to be broadcast on 60 MINUTES, Sunday, April 11 (7:00-8:00PM, ET/PT) on the CBS Television Network. Watch an excerpt. Berger, of the University of the Witwatersrand in South Africa, spoke to Simon at the site of the find in the Malapa Nature Reserve, an hour’s drive from Johannesburg. He says the bone Matthew had found would have been enough for any scientist. “That clavicle alone would have been a great find…Most people who do what I do…go through their entire careers and never find even a single piece,” he tells Simon. But when Berger later found a nearly complete skull, it became the find of his life. The remains, one of the most complete sets of that age ever found, were those of a young male about Matthew’s age. “I was like, ‘Oh, he must be my twin,’” recalls Matthew, now 11. Next to those bones, another almost complete set of remains was found, those of a 30-yr.-old female. Berger and his team believe that when the woman and the boy were searching for water, they accidentally fell into a cave, and died, within seconds, minutes, days or weeks of each other. “These two individuals looked each other in the eyes when they were alive 1.9 million years ago,” Berger tells Simon. Richard Leakey, whose family is perhaps the most famous in the world of paleoanthropology, was impressed by what he has seen. “There’s a lot of stuff there and it’s spectacular….so full of information,” says Leakey. “He’s got a treasure trove, no question.” says Leakey.